iolo’s breakthrough Whole Home License® allows product use on all of your home PCs. Computers and the internet have become so much a part of family life that the old days of sharing one machine have disappeared for most of us. Typically parents each have their own PC, young children start using them at only a few years old and soon have their own, and many households even have systems dedicated to a single function like streaming movies, playing games, or tracking kitchen recipes. The more home computers you have, the more of a hassle software licensing can be. Activating, deactivating, running out of activations, buying more licenses — it’s a pain. Nearly all software imposes frustrating limits on the number of computers one license can be installed on, such as “up to 3″ or “no more than 2″. Now, just download and install when and how you want. How does Whole Home License work with iolo System Mechanic? iolo’s award-winning System Mechanic® software is recognized by experts as vital for optimum PC performance and reliability. 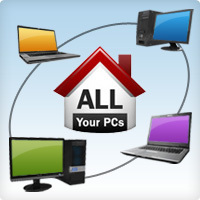 Without it, the more computers you have in your home, the more expense you can incur from service call issues, fixes, hardware failure, downtime and premature need for new computers. With a Whole Home License your family’s computer experience is optimized without regard to how many times you change out computers, add new systems, upgrade operating systems, or reformat hard drives. How do you apply the Whole Home License to all your household computers? Simply download your software from iolo’s website and use the activation key from your original purchase receipt. And one more thing: Even with the immense extra value included in the new Whole Home License, iolo didn’t raise its price. So whether you use it on one computer or ten, System Mechanic is one of the best bargains in the entire industry. With software that’s designed to grow with your family but without further add-on PC cost, it’s clearly a “no-brainer” investment you’ll want to make. Here are some Frequently Asked Questions about how you can apply your iolo technologies Whole Home License and install System Mechanic (or any other iolo product you purchase) on every PC in your home. Q. I have System Mechanic installed on one of my computers. How can I install it on a second (or third, or fourth) PC? Using the PC you want to install System Mechanic on, open up a web browser and go to http://sm.iolo.com to download and install System Mechanic, or if you own System Mechanic Pro, visit http://smpro.iolo.com to download and install System Mechanic Pro. Step through the instructions to download and install the program. Q. I used to have System Mechanic installed on one of my computers. How can I re-install System Mechanic on that same PC? A. You can re-install System Mechanic by following the steps in the answer given above, and using your original Activation Key. Q. Can I use the same Activation Key to install System Mechanic on more than one computer? A. Yes. When you are prompted for an Activation Key during the installation process, you should use the same Activation Key to install System Mechanic on any of your home PCs. Q. What if I’ve lost or misplaced my Activation Key? If you have a copy of System Mechanic already installed on one of your home PCs, launch the program and click on the Help dropdown menu in the top right hand corner. Select About System Mechanic. A small pop-up screen will appear with your Activation Key displayed on it. If you do not have a copy of System Mechanic currently installed on a PC in your home, click here and enter the email address you used to register your copy of System Mechanic. A copy of your Activation Key will be sent to that address.